Save your boat bow and hull gelcoat or personal water craft from chips. 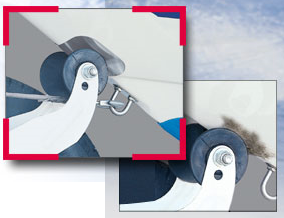 Protects your boat from scuffs and abrasion caused by trailer rollers. Made from anti-corrosive, 22-gauge 304 stainless steel. ScuffBuster products attach to your boat's surface with 3M pressure-sensitive adhesive. Guaranteed for a period of one year from the date of purchase. Seller's and manufacturer's only obligation shall be to replace any such product to be defective. ScuffBuster protection guards are very simple to install; however, the following instructions must be strictly followed. Any short cuts will jeopardize and compromise the full bonding capabilities of the 3M adhesive. Before installing your ScuffBuster protector, fiberglass mold release agents, waxes or contaminants must be removed from the surface of the boat. This can be done by cleaning with any number of products such as alcohol, acetone, toluene or xylene. Do not use paint thinner, lacquer thinner or other petroleum-based cleaners as they will leave a film, and compromise the bond to the adhesive. Always be sure to follow the manufacturer's instructions when using any cleaning agent. To further enhance the bonding process, lightly etch the area using a mild scotch brite pad, steel wool pad or light 320 grit sandpaper, followed by the above mentioned cleaning. Mark the boat hull area where the front trailer roller or V stop contacts the boat hull (bow protector) or the area where the tie-down buckle rubs against the gel-coat (tie-down buckle). If you are installing the bow protector, place it over the area you marked and carefully bend the ScuffBuster to fit the shape and curvature of the boat hull. It is suggested to over-bend slightly so as to create a "hugging" of the hull. This will aid in the long term bonding of the adhesive and take away any memory of the stainless steel. Be certain to leave the protective liner on the ScuffBuster Bow Protector while performing this task. Remove the liner off the adhesive and carefully place the ScuffBuster in position. Firmly apply pressure to get good contact and activate the adhesive compounds. CAUTION! When working or bending this product, ALWAYS WEAR GLOVES to prevent injury to yourself and others. This product can cut your skin if not handled properly.